Hi Delmarva! 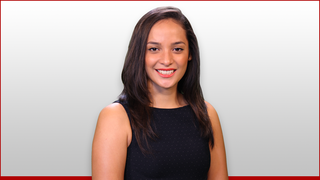 I’m Lissette Nuñez and I am your new reporter and producer. I joined the 47ABC news team in July 2015. I received my Bachelor’s degree in Broadcast Digital Journalism from Syracuse University in Syracuse, New York. Go Orange! During my time at SU, I was an entertainment reporter for a student-run radio station that goes by the name Z89. During my time in college, I became a member of the National Association of Hispanic Journalists and helped recognize the advancement of Latinos in the news industry. I also interned at WGN-TV in Chicago, IL as part of their entertainment team and had the opportunity to meet SNL comedian Jay Pharoah and actor Michael B. Jordan during my time there. I also interned at CNYcentral in Syracuse, NY where I covered one of the snowiest winters Syracuse has seen! I was born and raised in the South Side of Chicago, IL and come from a Mexican family. I love everything Chicago from sports and food and not to mention Chicago’s delicious deep dish pizza. I remember being interested in news since going back and forth between Spanish and English newscasts. I love meeting new people and listening to people’s stories. When I am not reporting or following the latest news, I love baking and doing karate. I have earned a blue belt in karate and looking to keep rising in belt levels. I am excited to be part of 47 ABC’s news team. Feel free send me story ideas via e-mail, Twitter, or Facebook! Made On Delmarva: Plak That Printing Co.